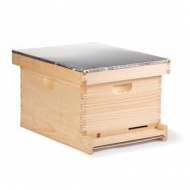 Start beekeeping with the Little Giant 10-Frame Complete Beehive. Features include telescoping outer cover, vented inner cover, 10-frame 9.5 inch deep hive body, 9.125 inch wooden frames with wax-coated black plastic foundation, screened bottom board, mite grid and entrance reducer. The hive comes pre-assembled for easy setup and use.